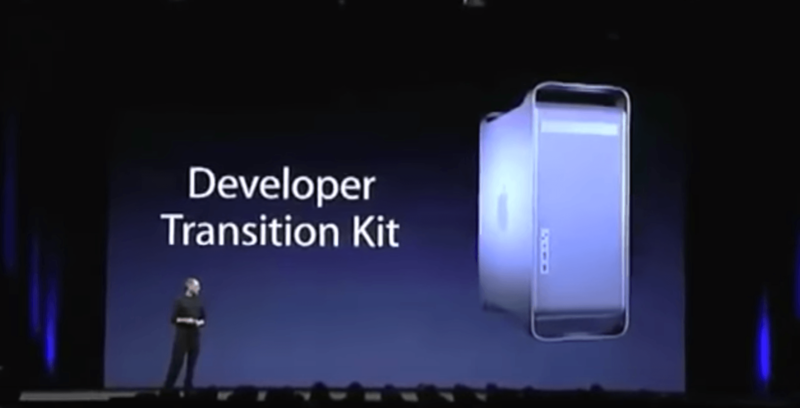 Transitions make or break when it comes to the details, and Apple had a lot of them at WWDC 2005. After admitting that every major version of Mac OS X has been compiled for both PowerPC and Intel chips, Jobs outlined Rosetta, which would allow PowerPC applications to run on Intel Macs without a hitch. Xcode was updated to version 2.1 to allow developers to build "universal" apps that would run natively on old and new Macs alike. To help with this work, Jobs then introduced a new computer. 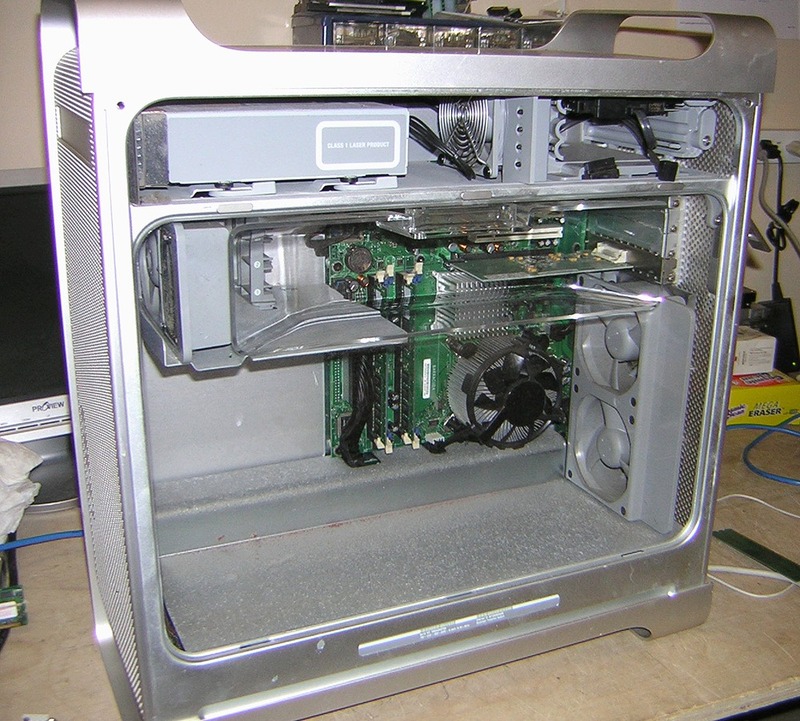 An Intel Mac inside a Power Mac G5 body, the Apple Developer Transition Kit (or DTK) was made as a way for developers to work on their x86 applications before the first Intel Mac shipped to customers. The machine came with a 3.6 GHz Pentium 4, a CPU that would never end up in a shipping Mac, as Apple launched with the Core Duo line of processors. It ran an Intel version of Mac OS X Tiger. 10.4.1 came on these machines; Apple was up to 10.4.4 by the time the first MacBook Pro and Intel iMac shipped in January 2006. This is a development platform only. This is not a product; this will never be shipped as a product. It's just for you guys to get started in development. You actually have to return them by the end of 2006. We don't want them floating around out there. These are not products. To borrow one of these systems ran $999, and they shipped a few weeks after WWDC. Once they were in the world, things got interesting as people started poking around inside. A small logic board labeled Barracuda sits inside a ridiculously large tower (to fool the passers-by). The processor is a 3.6GHz Pentium 4 with Hyper-Threading. These development-based Intel Macs appear to be shipping in a slightly modified aluminum Power Mac G5 enclosure that sports an altered cooling system consisting of a different fan configuration. Located at the rear of the unit are two USB 2.0 ports, a Gigabit Ethernet connector, and one FireWire 400 port. On the front of the unit, developers have access to a headphone jack, one USB 2.0 port, one FireWire 400 Port and a micro switch that comes mounted next to the power switch and can be activated by a paperclip. However, its function is unknown. As this Daring Fireball post shows, even the noise wasn't as bad as some had feared. Sources have indicated that Apple will employ an EDID chip on the motherboard of Intel-based Macs that Mac OS X will look for and must handshake with first in order to boot. Such an approach, similar to hardware dongles, could theoretically be defeated, although it's unknown what level of sophistication Apple will employ. Also uncertain is whether the Intel-based development kits seeded to developers already feature the EDID chip or whether the installation disc contains a less sophisticated installation check that simply seeks out one particular hardware configuration — the one given to developers — and will not install on other configurations. The gist of the situation, reportedly, is that at least some portions of the Intel Developer Transition Kit version of Mac OS X are strung up in such a way that depends upon the TPM module on the Transition Kit motherboard. I say “reportedly” because I can’t say for certain there is in fact such a module on the motherboard, because I don’t have a Developer Transition Kit, and even if I did, I’d be under an NDA that would prevent me from discussing it. But I think it’s safe to assume these reports are true. The effect of this, surprise surprise, is that the version of Mac OS X that ships with the Developer Kit hardware only runs on Apple’s Developer Kit Hardware. Which state of affairs is exactly what Apple stated, clearly and publicly, when they announced the transition at WWDC in June. What Apple hasn’t stated publicly is how, technically, they were going to keep Mac OS X compiled for x86 from running on non-Apple x86 computers. The TPM chip is, apparently, at least part of the answer. When you first start the machine a BIOS screen appears, allowing you to hit F4 and set the boot drive order, system date, etc.. No Open Firmware here. Unlike other Macs the hard drive needs to be partitioned using Master Boot Record (MBR), not GUID as used for all shipping Intel-based Macs. That’s unique. This thing is really a PC with proprietary software pasted on top. Rosen was able to bring it back to life after finding the original version of Mac OS X it came with from Apple. Oddly, the machine required the Install DVD to be present at startup, something no other Mac has ever needed. With a switch to ARM all but certain, I've been thinking about the DTK in a modern context. Would Apple ship a weird half-baked ARM Mac ahead of its official rollout to give developers a head-start on rebuilding their applications? Times are different now. 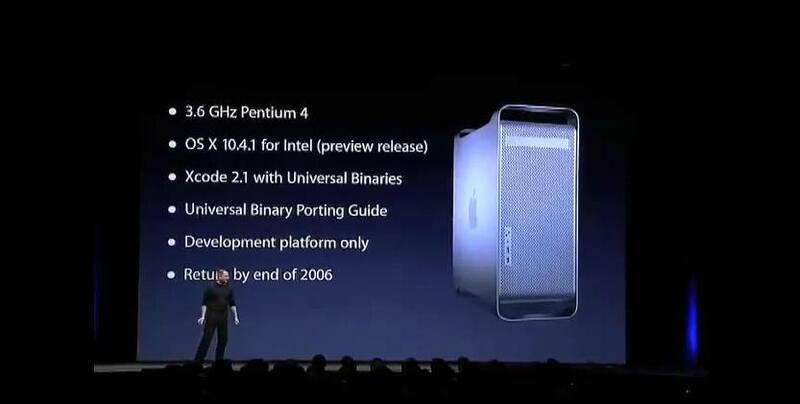 In 2005, the DTK was Apple's first Intel machine, but Apple has shipped millions of ARM devices. In fact, Apple has sold more ARM-powered devices than the total number of Intel Macs. While a "development only" ARM Mac would surely be beneficial to many, would Apple instead rewire the iOS Simulator in Xcode to accept modern Mac apps? Could it create some sort of sandbox to run these programs on an iPad Pro? The possibilities are numerous, but as a hardware guy, I hope 2019 or 2020 is a repeat of 2005, and we see another "this is not a product" moment from Apple.